One of our regular readers has suggested we should write a book: a compliment indeed, but we're not sure it would be all that interesting. However, we have had not one, but two more magazine articles published for your enjoyment or otherwise... The first is called Love Me Tender, published in the in the Bavaria Owners' Association Autumn 2012 magazine, the second is called The Rewarding Rias, published in the March 2013 issue of Sailing Today. If you missed the latter (shame on you!) you can order a back issue here, but the publishers of both have kindly granted their permission for us to reproduce the articles. You can see all our published articles here. I walked to the supermarket one day recently in glorious warm sunshine, thinking that spring might finally be on the way. When I came out of the supermarket I heard what I initially thought was a heavy lorry rumbling along the road, but discovered it was a thunderstorm heading my way. My journey back to the boat was brisker than normal and I was lucky to get the shopping back aboard before it arrived. I keep thinking it's just us who are fed up with the apparently uncharacteristic constant wind, but everyone else in the marina is feeling the same. It is incredibly wearying and makes doing jobs outside fairly impossible, not to mention reducing incentive levels to virtually zero! Surely it must improve soon. We have, though, recently had strong winds from another direction instead of the usual W-NW. Easterly, south-easterly and southerly winds have made the boat heel in the opposite direction, feeling a bit strange but most irritatingly, coating the boat in salt and red African sand. Meanwhile, we seem to keep very busy, me doing the morning walks and twice weekly Zumba sessions to keep fit, shopping and washing, Andy doing boat maintenance when weather allows, and when not, researching various solutions to some trickier repairs plus researching options for lifting Pipit out of the water to antifoul, polish, etc, when we reach the Ionian. I also seem to have volunteered myself to do the compilation and layout of a cookbook containing recipes contributed by the cruisers over-wintering here. Our liferaft has returned from being serviced in Malta. The price escalated considerably from what we were initially quoted, but what could we do? To have it serviced in Italy would have been even more expensive. It wouldn't have cost us much more for a whole new liferaft in the UK, but not here - we used to think all things 'boaty' were expensive in the UK, but in our experience it's one of the cheapest places for chandlery. We didn't actually recognise the raft as being ours when we unpacked it from its bubble-wrap - the canister was filthy, as if it had been sitting around in an outside compound for months, which it may have done, and it was covered in packing tape residue. Anyway an hour or so of cleaning and polishing returned it to its former condition. Another little job has been to replace the quartz movement in our cabin clock. We had a very pleasant email back from our enquiry to Nauticalia saying they could not supply a new movement but could supply a whole new clock for the discounted price of £79.99 instead of £99.99. I found a supplier of new movements online who provided what we needed for £9.54... Incidentally we were told during our investigation that one particular brand of 1.5V battery (you can probably guess which) is actually more like 1.8V when new in order to enable the manufacturer to claim their batteries last longer than other brands. I haven't put my meter on a new battery to confirm this but if so, it's probably ok for torches etc but not good for quartz clock movements - they operate on a nominal 1.45 - 1.55 Volts. If it is true it might explain the demise of our original movement. There are still more jobs to be done before we leave, but we are getting through them gradually as the weather allows and motivates. We have also ordered charts and pilot guides for this year, so will soon be able to start planning our journey to Greece. So back to the subject of cooking and food, a favourite one, I return to the headline photograph of the artichokes. We have seen and bought artichokes in markets previously, notably in Brittany, but were not over-enamoured with the results of our efforts of cooking them, given the preparation involved and particularly the amount of waste created. 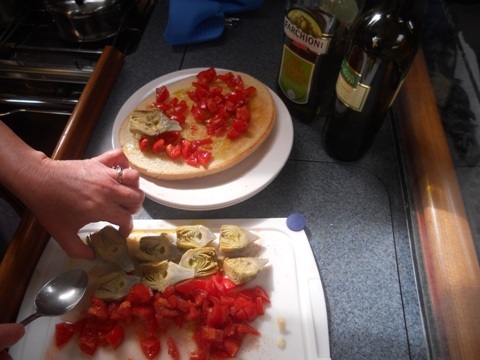 So, when Jenny and Robert on Venice Lion offered to give a demonstration to a group of the ladies on how to select, prepare and cook these little beasties, now at the peak of their season (the artichokes, not the ladies, although obviously all of the ladies are always at their peak! ), I joined the class. Robert aka Jamie Roberto Oliver was great as chef instructor, with everyone getting a chance to prepare one artichoke for the pot of stock in which they were to be cooked. It was much easier than my previous attempts thanks to Robert's instruction, not the least of which was to select small artichokes that are tightly closed up - these have more tender hearts and don't need to have the centre core removed. Also, artichokes that are smaller externally have the virtually the same size heart as larger ones. As soon as each artichoke is prepared, they must be put into acidulated water (water with lots of lemon juice) to prevent them going brown - this was the only bit I had done right previously. 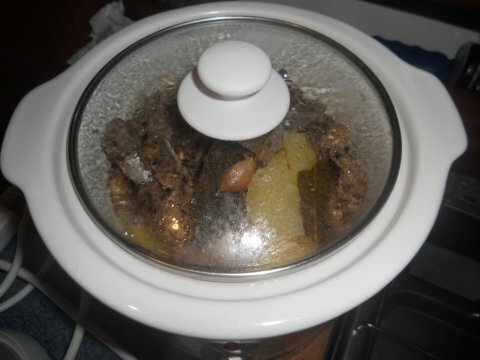 The artichoke hearts were then cooked in the stock, which was made by softening onion and garlic in olive oil, then adding white wine and water, rosemary, thyme, bay leaves, salt and pepper. 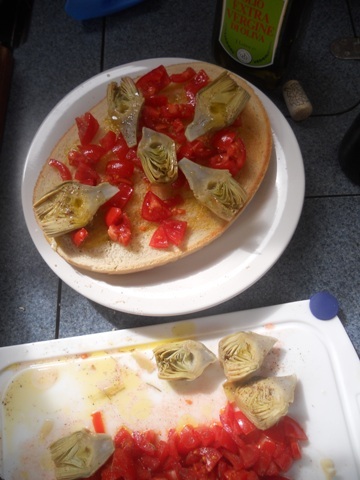 The results were absolutely delicious, and we all enjoyed sampling the artichokes, some which Robert served on their own with just olive oil, salt and pepper, and some with a vinaigrette made with a sweet white wine vinegar. The following Tuesday, market day in Marina di Ragusa, I bought some artichokes and, whilst my first effort post master class was not quite as good as those Robert had cooked, they were really yummy! The bonus of cooking artichokes this way is that the stock is also delicious and can be used afterwards - Andy used it for a lovely risotto the following evening. We are investigating the possibility of spending next winter in a nice villa in the Ionian, with Pipit in a berth close by. We do love living aboard, but we haven't had any time away, with the exception of the enforced month's break during the winter freeze of 2010 in Brittany and the week in Lagos when Andy's mother visited. Even on those occasions we spent at least some time on the boat very nearly every day. When we lift Pipit out of the water for annual maintenance and stay on land we don't really count that as a break away since we spend virtually every day working on the boat. We want to go no further than the Ionian this year (and perhaps even the following year) - after all, it was chartering there that sowed the seed of this adventure. We know that the winter will be relatively cold and wet, so the idea of a villa with a log fire, full-size kitchen (including dishwasher!) and more space has developed an appeal which is very alluring. So far, there are a couple of lovely places on the short-list.